I love linens! Yet, I've never had a great way to store them together. I sorted each pile of napkins and treated stains as needed. You can see that each pattern fits into my general colors of blue, green, yellow, and cinnamon red. Seems extravagant to have so many choices, but I calculate that the whole collection cost less than a jumbo pack of Bounty paper towels! 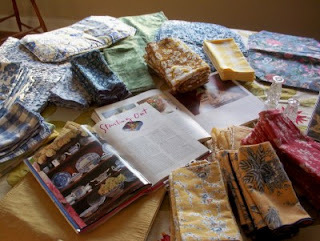 Napkins stored in one place make it fun to create different looks for your same-old table. 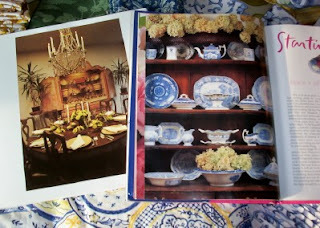 I checked out two books from the library for inspiration: Barbara Milo Orbach's Tabletops and The Perfect Setting by Peri Wolfman and Charles Gold. Flipping through the pictures made me realize that my dining room needs better storage and/or a tall piece at the end. Hmmm. 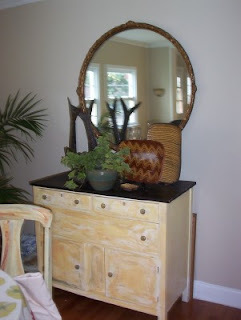 The existing sideboard and mirror (both hand-me-downs) aren't wide enough to anchor the wall. But I do have the huge armoire in the garage, the one that wouldn't fit in the living room. Could I paint the inside a contrasting color and open its doors for display? I hope I can convince him to help me move it back inside! He suggested buying a new dining set for our anniversary, but I'd love to work with what I already have. Oh Yes, Meredith, do bring the armoire back in! I think it would be lovely with a contrasting color inside. It would certainly anchor a wall as well. If anyone can make it work, you can! And I think it sounds like a fabulous idea. I think that is a perfect idea!